The Williams team today revealed one of those terribly kept secrets in Formula One, that they are partnering with Martini for the coming season. It’s a multi-year agreement that makes Martini the title sponsor of the team, and they are rebranding themselves Williams Martini Racing. 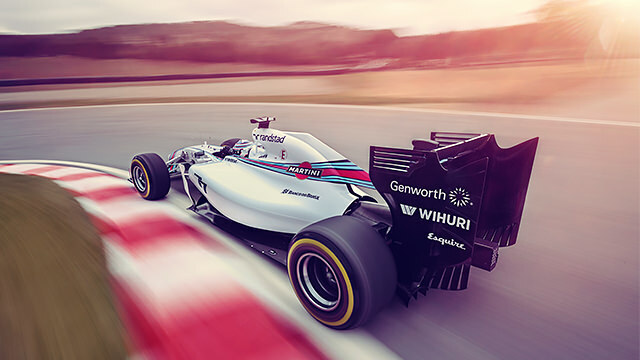 The 2014 livery was also unveiled, very, very white, with those traditional blue and red Martini stripes. The team held an event today to reveal the new partners, livery and overalls, with all the drivers present in their sparkling white kit. Martini claim to have been one of the first “non-motorsport entrants to sponsor a racing team” when they set up Martini Racing back in the 1960s. However, they entered F1 as a sponsor in 1972, and were most recently partners with Ferrari, departing in 2008. Just four short years later, and they’re ready to embark on a new adventure with the rejuvenated Williams team.